Created in consultation with Kāi Tahu Whānui kaumātua, Maurice Gray and Maurice Nutira. The stone columns each represent an area of the land from the tops of the mountains through the river plains to the sea. Erosion on the way formed the land the university now stands on. The name Te Paepaetapu O Rākaihautū encompasses the region that the stone represent. Here, Rākaihautū, commander of the Uruao canoe which arrived in 850 AD, traversed, rested and explored, creating landmarks present to this day. 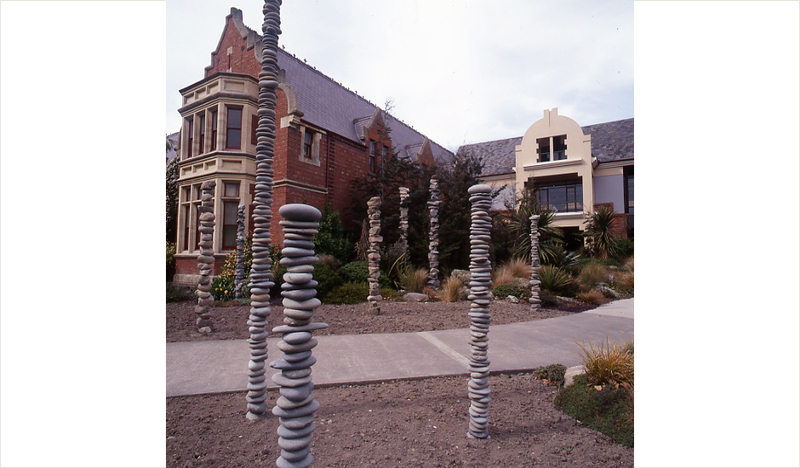 The sculpture was named and dedicated by Maurice Gray, Head of Department, Centre for Māori Studies and Research at Lincoln University and Maurice Nutira.